SPARTUS CUT 65 with cutting power up to 40mm. + Machine cutting torch PT80 6m. SPARTUS CNC Master CUT 65. 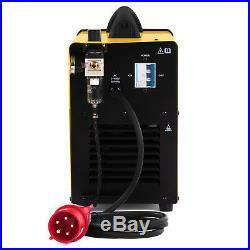 Professional inverter plasma cutter constructed with IGBT transistors technology. Designed for cutting metals and other conductive materials up to 40mm. Device is power supplied from a 400V three-phase network. CUTTING CURRENT - 20A - 65A. >Modern, reliable and extremely light (about 30% lighter than other devices with similar power). 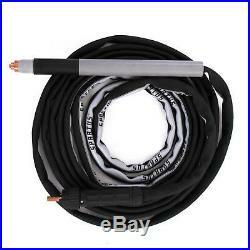 It allows cutting with a current in the range of 20 - 65A, elements with a thickness of up to 40 mm. Control panel is equipped with a current regulation knob, LED indicators and a gas test switch. It has a smooth adjustment of the cutting current. Torch connection indicator / torch not conected D. Work indicator, cutting being processed E.
Gas test / Auto switch. Gas regulator with built-in air filter. 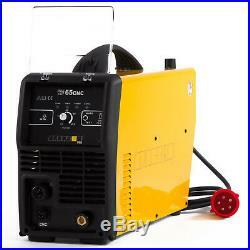 Plasma cutter has a built-in gas regulator equiped with an air filter that separates water from a supplied gas. 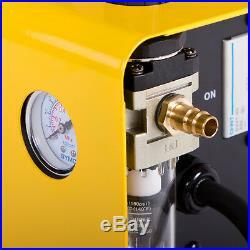 It works with any air compressor on the market. The device can be used as a power source with a professional CNC cutting tables. 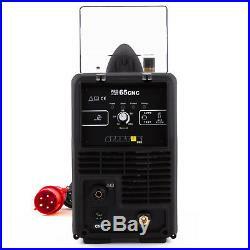 It has a connector that comunicates with CNC cutting table software. 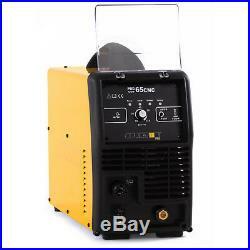 Plasma cutter is equipped with a voltage divider module that allow you to match up the output voltage level to many commercially available height control systems. It has 4 settable ratios (20:1, 30:1, 40:1, 50:1). The ratio is changed by pulling the cover off and setting a small series of switches per instructions in the operators manual. 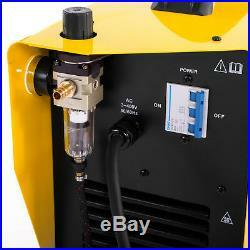 Durable machine cutting torch designed for better comfort and simplicity. Enables cutting of all kinds of metal material of different thickness up to 40mm. Torch has a standard Euro connector. 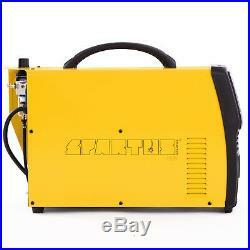 Maximum cutting current: 80A - Cooling type: gas - Arc ignition: Blowback - Gas flow: 160l/min - Torch lenght: 6m. Plasma cutter goes with a cutting torch and comsumables parts for that torch. The box contains spare electrodes, nozzles, heat shield, crown shield, brackets etc. The torch set extends use of the torch before the need to supply with new spare parts. Please note that one set of spares is already installed on the torch. 16 x Cutting nozzles 14 x Electrodes 1 x Heat shield 1 x Crown guide 1 x Swirl ring 1 x Tool key. Blowback arc ignition system is an advanced arc start method. It effectively reduce the usage of torch consumables. The system works by pushing the electrode back and igniting arc without need to contact the working material. Example use of our plasma cutter with a cutting table. 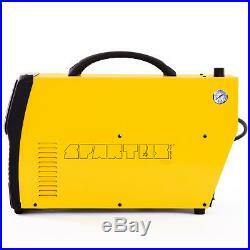 Please bear in mind that device can be used with different cutting tables available on the market. 64 x 24 x 45 cm. 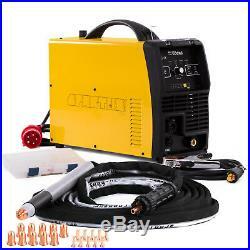 Plasma cutter SPARTUS CUT 65 - Cutting torch PT80 - 6m. Torch consumables set - Groung clamp - 3m. In particular, it relates to the circuit board and the inverter. It does not extend to the housing and its external components and connecting parts, such as the hose pack or the mass clamp. We deliver all over Europe. You can be sure your parcel arrive on time. Our professional customer service team is here for you seven days a week. You will be provided with the best customer service so you won't walk away unsatisfied. The item "CNC PLASMA CUTTER 65 AMP Spartus Cut 65 CUTTING UP TO 40mm Blowback 400V" is in sale since Friday, August 10, 2018. This item is in the category "Business, Office & Industrial\Metalworking/Milling/Welding\Welding & Soldering\Welding\Welders, Cutters & Torches\Plasma Cutters". The seller is "allweld_supplies" and is located in Rzeszów. This item can be shipped worldwide.